It is true that sportsmen are the ones who inspire us very easily than any one else. May be it is because we keep track of their performance or may be their success is validated with numbers, figures and statistics. I personally have learnt a lot from Rahul Dravid since 1996 and I never turned to any other player for any source of inspiration. 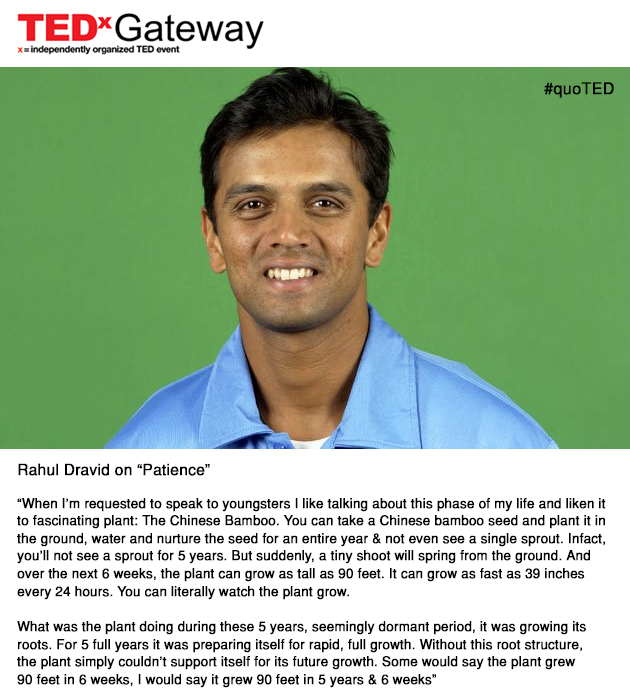 Earlier I had written a post on Rahul Dravid being my role model. It can be read here. Even after his retirement whenever I see his sayings or words of encouragement in any interview, I again feel energetic and a gush of confidence passes through me. Recently I came across this. Like many, I can relate to this very easily. The feeling to give up comes quiet easily when we fail in every endeavour. But this text sums it all. So lets work towards our goals unflinchingly. Yeah about Chinese Bamboo i had to do an intense research when my Dad was reading the latest book by Paul Coelho and he called me up from Patna and asked me to find out if it was a mythical tree or what. i googled and told him all about it's existence as a reality. Little did i know myself then that people in India have it in their homes too so when we went to Singapore for our son's graduation ceremony and we went visiting the Botanical gardens there we asked the tour guide to show us Chinese Bamboo. i tore my hair in despair then because it was there in my place, in my colony in my country too and i was not aware of it's strangeness/ uniqueness. Felt like sharing this with you. Thank you for sharing this. Paul Coelho's book Aleph mentions Chinese Bamboo in the same flavor. Inspiring indeed the story of this tree this Chinese Bamboo. Firstly thank you very much for stopping by and taking time to write an informative comment. I had once seen it in discovery channel and believed it to be fake. My eyes had never seen a chinese bamboo. Well when I read further came to know about it. I would surely go through Paulo Coelho's book for more inspiration. I start by telling her a story. "A man stumbles and falls into a deep hole. He asks a passing priest to help him out. The priest blesses him and walks on. Hours later, a doctor comes by. The man asks for help, but the doctor merely studies his injuries from afar, writes him a prescription and tells him to buy the medicine from the nearest pharmacy. Finally, a complete stranger appears. Again the man asks for help, and the stranger jumps in the hole. "Now what are we going to do?" says the man. "Now both of us are trapped down here." To which the stranger replies: " No we're not. I am from around here and I know how to get out."" "That I need strangers like that," I explain. "My roots are ready, but I will only manage to grow with the help of others. Not just you or J or my wife, but people I have never met. I am sure of that." Hello Shivani ji, I thank you very much for sharing the text here. I was busy and hence could not exactly read it. Also I have added the book in ''to read'' list. Thanks for passing on the source of inspiration. 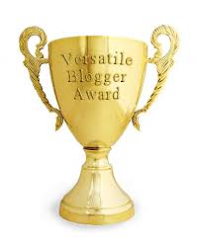 If you see my blog archive for this year, I had blogged less, due to commitments to other things. And due to lack of time, I am unable to read blogs. Other than that there is no other reason in not reading your posts.